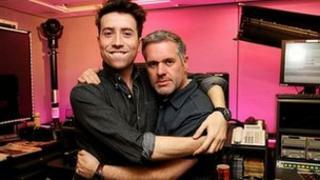 Radio 1 is to scrap sung jingles on its breakfast show when Nick Grimshaw takes over from Chris Moyles next month. In a document sent to music firms, the station said it was looking to commission a new theme different to previous shows. It said the theme must "sound slickly produced and original" and feature "live instrumentation and an identifying motif (logo)". The Radio 1 breakfast show with Nick Grimshaw begins on 24 September. "The new breakfast show will sound young, exciting, big and confident," the document goes on. "It needs to stand out and not sound like any previous BBC Radio 1 breakfast shows. Please steer clear of sung jingles and variants of breakfast themes and identities past and present." Outgoing presenter Chris Moyles has based his show around sung jingles over the past eight years. The jingles - which are written by Moyles together with jingle specialist Music 4 - sparked controversy after it emerged in 2006 the DJ was paid royalties every time he played them. The pitching document states the newly commissioned theme would be purchased on an "all rights" basis. This would allow BBC Radio 1 to fully own the package "in perpetuity and exclusively", with the creator retaining his or her composer rights.